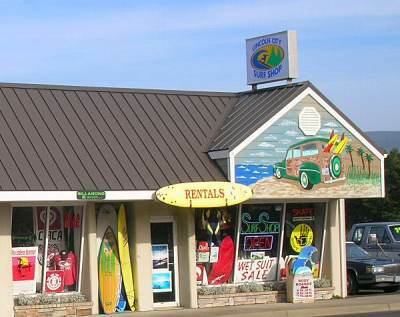 Welcome to the Lincoln City Surf Shop. We have the largest selection of equipment for rent and/or purchase in the area. Use the links to the left to see what we have for you. 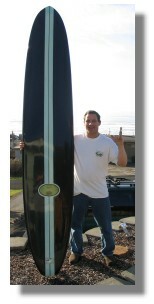 We buy classic longboards and surf memorabilia. We also take trade-ins on surfboards, snowboards, wetsuits, skateboards, and much more, you name it! 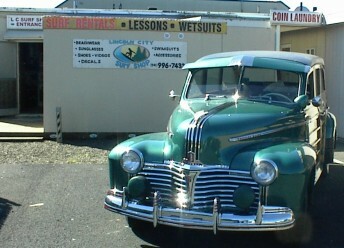 And stop by to check out the Northwest Surfing Museum and get a blast from the past, you won't be disappointed. Give us a call, you're just one ring away from the best surfing on the West Coast. Check our new site Click Here! Be sure to stop by the Northwest Surf Museum - We have over 25 surfboards on display and be sure to check out the board that Joel Tudor rode in the 1993 Tressels contest. We have plenty of parking behind the shop and there is an entrance into the shop as well.